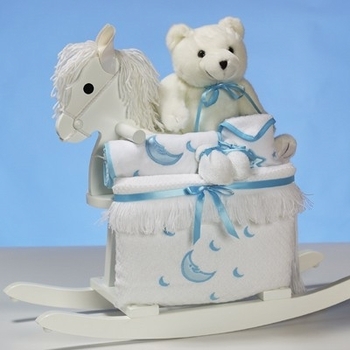 This exclusive wooden rocking horse gift set for baby boys is a winner! Beautifully finished and exquisitely wrapped, this unique gift will be appreciated a long time. This adorable ensemble comes stuffed with essentials that baby needs now while the rocking horse will be the perfect toy as he grows. The terry baby bib can also be personalized with the boy's name for an extra special touch! The entire set is carefully gift wrapped in sheer tulle for a very impressive presentation! See More Images above to see photo showing the collection that has been personalized with baby's embroidered name.